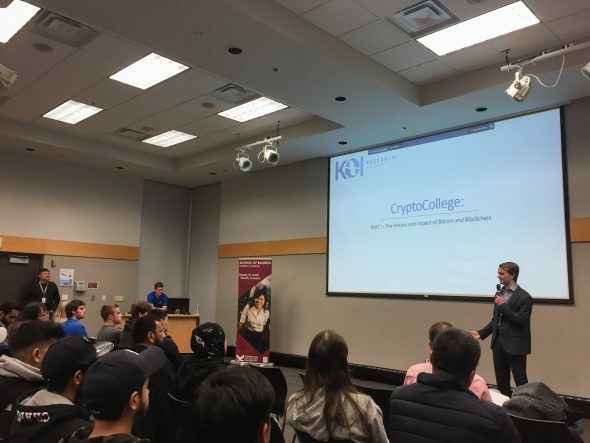 The Marketing Department at KPU hosted The History and Impact of Bitcoin and Blockchain, an event featuring four speakers from either HoneyBadger and KOI Research Group, on Feb. 26. KOI Research currently organizes workshops, offers consultations, and features speakers at conferences and events to share information on cryptocurrencies. HoneyBadger, founded in 2016, provides kiosks for buying and selling bitcoin at physical location using physical currency. Since its inception, it has expanded to offer 45 ATMs—the second highest by number, and highest by distribution, across the country. The CEO of HoneyBadger, Keirnan Wright, says that he wasn’t interested in cryptocurrencies when he first began researching them. It wasn’t until he went to a meet-up of industry professionals that he felt compelled to join a bitcoin co-op in Vancouver. There, he met one of the founders of HoneyBadger, got a job as a sales manager, and became the CEO that same month. HoneyBadgers’s mission is to make purchasing bitcoins more accessible, as “the biggest hurdle is just getting it in the first place,” according to Mike Kitt, another member of the HoneyBadger team. He and his coworkers are hoping to set up another 50 kiosks by the end of the year and are offering $500 to anyone who can help install another outlet. The presentations at the Feb. 26 event featured the speakers’ experiences and some background information on cryptocurrency. In a TED Talk that Cedar says made the cryptocurrency market more credible, a leading authority on the subject, Don Tapscott, says that “the next generation of the internet … holds vast promise for every business, every society, and [every individual].” Cedar supported this statement by reminding attendees at the event that there is currently a $500 billion market in cryptocurrencies, which represents a 2800 per cent increase since the beginning of 2017. Kitt adds that those who are worried that it’s too late to invest in bitcoin, ethereum, or similar options have no cause to be concerned.